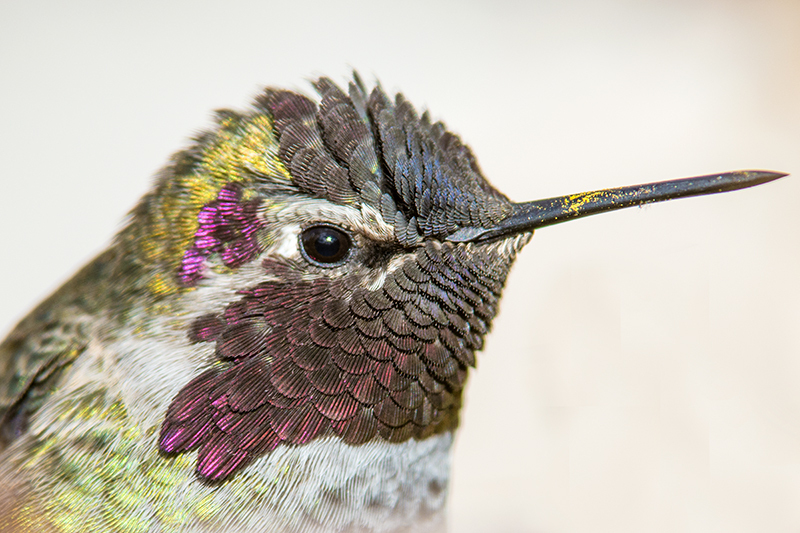 Every winter when the weather turns cold for the first time in the Sierra Nevada Mountains, Anna’s hummingbirds come down to stay in the lower elevation areas where the weather is milder. I photographed this flashy little male Anna’s hummingbird in a winter bare peach tree. I like that you can see pollen on its beak from a recent flower that it visited. What a beautiful photograph; I love getting to see the detail (the pupil!!) in its eye. I love the gorgeous coloring of the individual feathers and the the shading. You’ve captured such great detail. Wow! I love being able to see the feathers!